Sorry for the gap in postings but it’s been non stop activity here. This past week has been grueling. The garden is winding down in terms of time spent maintaining but the jungle has continued to creep and grow. I got a good start on trimming it a few weeks back when Simon helped but it was just a small dent in the total area so this week I put my full attention on it. The added incentive or push comes from the fact that we are having a father’s day event here, some house guests from Tampa are visiting for a few days next week, and George is hosting an annual fish fry for his motorcycle club and that invariably spills over onto our dock. It just so happens that this week was also the hottest so far this year and touching on all time (for the date) records. When I work in the jungle I have to wear long pants, long sleeve shirts, and heavy duty gloves and socks to help protect from bugs, saw palmettos, and other hazards. That’s no big deal in January but this time of year, about 4 hours is all I can deal with. The clothes are totally saturated by the time I wear out. I’m guessing I’ll have dropped 5 pounds by the time I hang it up and label the task done. As big a job as cutting and yanking out the jungle is hauling it to the burn pile. Visualize a pile of brush 10’x10’x6’ – I get one or two of those every day. The grand finale each day is putting that to the torch. I feel like one of those CA forest fire fighters. Tom and family came to the lake on Father’s Day and a fun time was had by all. One objective of the day was to put a new roller on his trailer. Since the get go launching and retrieving the boat has been problematic- doable but not always clean. Our analysis was that it needed another roller. Bingo. On a preliminary basis on our lake it seemed to do much better but we decided to try it out in a real life situation on the Wekiva River. Along with a great day of fishing, lots of wildlife sighting – gators galore, owls, manatee, turtles etc. The launching couldn’t have been smoother but the real test was a one operator retrieval. Tom pulled it off perfectly so the new roller configuration did the trick. Bear report. Our neighbor George called the other day to inform us that a bear had jumped down out of the trees surrounding his house to get at a hanging bird feeder. Barbara was very close by when it happened and it scared the hell out of her – as it would any of us. It’s been a while since we’ve had any tell tale signs of bear activity but………. We had company this weekend from friends living in St. Pete. Barbara and Renee Brosan visited again and we had a great time. The Brosan’s are friends from the early ’70’s in Altamonte. Took the SunRail train to Winter Park; the gals did a little shopping while I relaxed on a park bench. Then a nice lunch where we were joined by Tom. That was all on Thursday. On Friday we spent most of the day on the dock or in the lake. Joey came over in the afternoon and we rode out a miniature hurricane huddled together on the dock asking ourselves what kind of a mess we were in. Just a lot of fun. 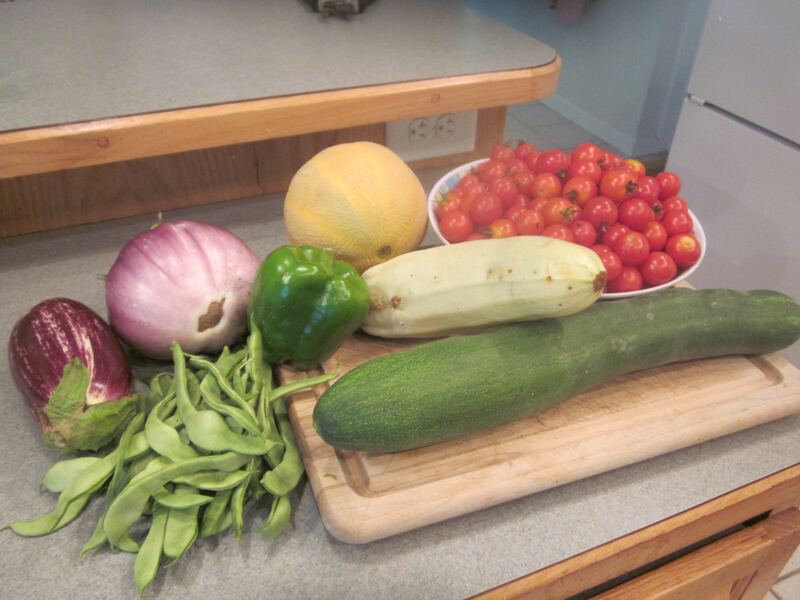 Lindsay emailed that the South Carolina garden we planted has started popping out, both the squash and the bush beans. I’m more excited about that than I am my own garden. I was fairly certain the squash seeds would germinate since they are this season’s but the beans were left over from last year, making them suspect. I had told them to expect to see something in one week and crossed my fingers. They actually started popping out in 5 days so at this point, I’m off the hook. I’m very confident they will be well cared for and only hope the soil and location are up to the job. Tom and I went to the Tomoka River on my birthday. We caught fish and he treated me to lunch at the Tomoka River Grill. It’s a good restaurant where we sat outside on a patio and watched the river action. Lot’s of fish jumping and we were entertained this time with a manatee, an alligator, a porpoise, and loads of rolling tarpon. I got a complimentary piece of orange cake to honor the day – the best I’ve ever had. The Tomoka River is brackish so we catch a mix of fresh and salt water fish, this time bass, snook and a redfish. Lot’s of rolling tarpon but we just couldn’t get one to strike. Bet I’ll be back there soon. Craving excitement, I decided to make a cherry tomato pizza for dinner. Nancy plays bridge away today so it’s my day to come up with the evening meal. To spice it up I added French cut fresh picked green beans to the toppings. The toppings include a couple handfuls of cherry tomatoes cut in half, a green pepper, an onion, basil, oregano and the green beans all marinated in olive oil overnight or for at least 6 hours. Spread it on the shell, sprinkle liberally with mozzarella and parmesan cheese and pop it into the Holland grill for about 15 minutes. I debated blanching the beans for a few minutes before mixing with the other stuff but decided to stay on the wild side and leave them raw. It certainly looks good and it tasted even better. The beans were perfected without blanching. Back home from the Christening. Mission accomplished. Elizabeth Anne stole the show and didn’t let out a peep when the water was sprinkled on her head; maybe a little later but nothing during the ceremony. We’ve been to more ceremonies at that little South Carolina church than any since leaving Salt Lake weddings and baptisms. Also got a small garden started for Grace in the back yard. I had brought up some bean and squash seeds to get Grace started since she had shown so much interest in the garden here. We picked out a nice spot along the back yard fence and got started. Wow – it was like working in red concrete. There was no way to break into it with anything resembling a conventional garden tool and started looking like the whole project was in danger. I had a tool box in the trunk of the car and took out a screw driver and hammer and started chiseling away, a chip at a time. An hour later with a pound of sweat invested, I had a 6’ x 1” strip down about 6” deep. I wasn’t convinced seeds would ever sprout in this soil/gravel so we hit Walmart and picked up a couple of bags of compost and a watering can. So let the farming begin! I sure hope something grows. A couple of posts back I mentioned that Simon and I had cut back the trees/bushes outside the bathroom windows. 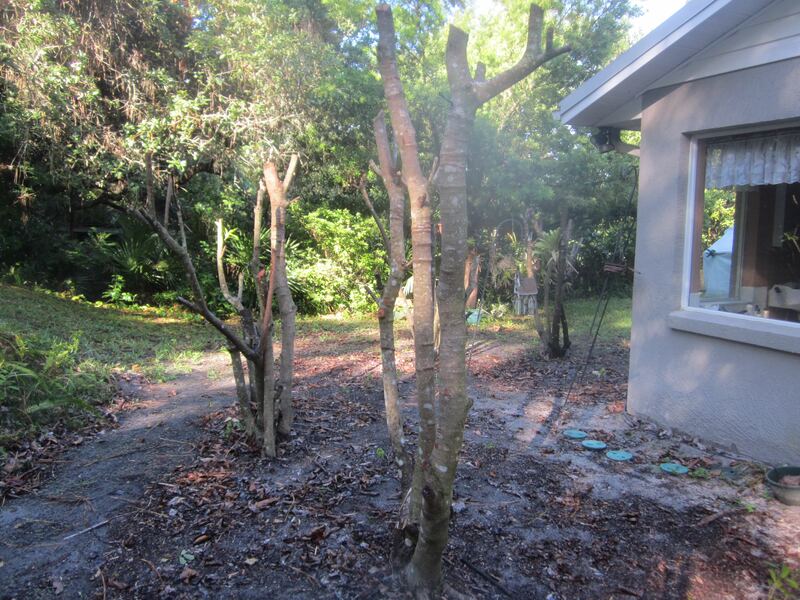 This is a pic to give you an idea of how drastic that trim job was. For whatever reason the leaves started dying about 6 months ago and they were nearly bare when it became obvious they weren’t coming back on their own. This happened one time before about 5 years ago and they survived a similar cutback so I’m hopeful that they’ll recover again. There were six when we started, four when finished – we decided to take two out completely. You couldn’t tell it from looking at the post trimming pic but these bushes were close to 20’ tall. The ground was completely covered with dropped leaves, several inches thick. We vacuumed those up and ran them through the leaf chopper – lots and lots of mulch. We’re full in the summer harvest mode now with loads of tomatoes, green and jalapeño peppers, eggplant, cucumbers, squash and green beans. The pic is the “catch of the day” and, believe it or not, typical rather than exceptional. This is turning into the most productive summer ever. The nematodes seem to have taken a pass on this year or maybe they just moved on to an easier place. I did scare up a rabbit inside the fence this morning but they don’t seem to ever bother anything except brand new seedlings and we’re months past that. Rabbit stew? Rabbit and squirrel stew? Finally starting to get some rain after a really dry May. Not enough here at the lake but at least some action. I’ve been surprised at how well the plants in the garden have held up in the dry heat with no signs of late afternoon wilting. That’s a good sign that the soil has enough organic material to hold moisture way beyond the native sand. 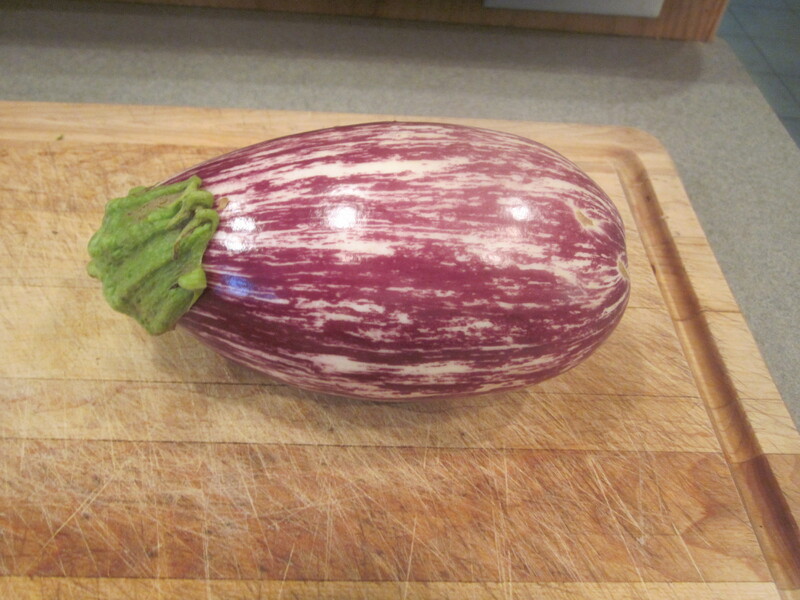 Picked the first eggplant which went from hanging on the bush to parmigiana in just a few hours. That was along with a couple pounds of plumb tomatoes, a couple of green peppers, basel and oregano picked at the same time. This is a new (to me) eggplant variety, hence the picture in case you were conjuring up the image of one of those old fashion black ones. I planted 7 this time around, anticipating only 3 or 4 surviving but they all seem to be doing well and the bushes are loaded with tiny fruit and blossoms. Our newest neighbors seem to love veggies so there will be more than enough to go around. Starting to plan the fall garden already – that’s the stuff ready for harvest in November and on to the first freeze. Seeds for tomatoes and peppers actually get planted indoors by mid July with a target date of mid September to hit the big time. Then mid September, seeds for squash, cucumbers, and green beans are planted directly in the garden. And at that time, seeds for the winter crops are started indoors. They’re to be garden ready in November/December. The big activity this week has been cutting wood for George’s fireplace. A neighbor across the lake lost 3 large pine trees to lightning about a year ago. George dragged his portable generator over there along with chain saws and all accessories needed to cut the 80’ trunks into 18” chunks. 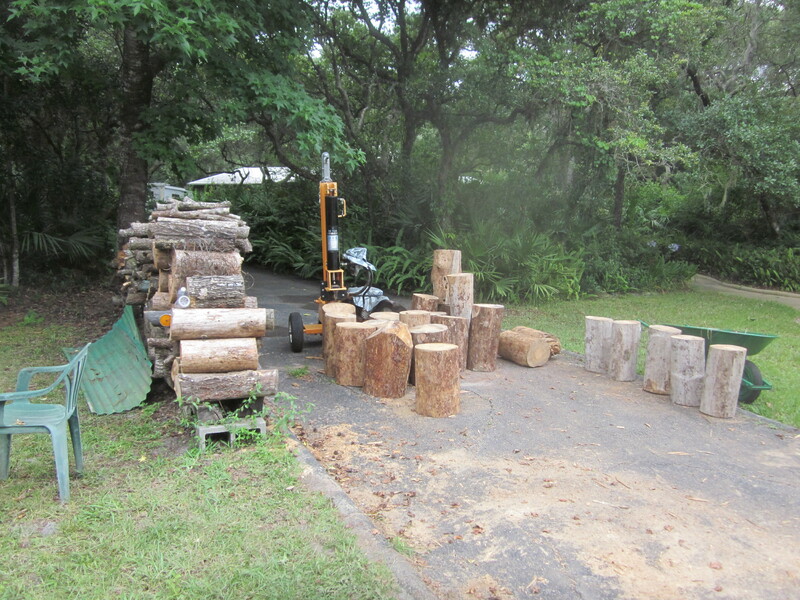 These chunks were then carted back to George’s house where we split them into burnable pieces and stacked them into the newly renovated wood pile. It took a total of 4 days (4 hour days) to complete the task. It sounds harder than it was because of the 22 ton log splitter George borrowed. Pine burns faster than the oak he usually uses but it’s actually easier to deal with. Trust me, I slept good all week. Totally worn out. 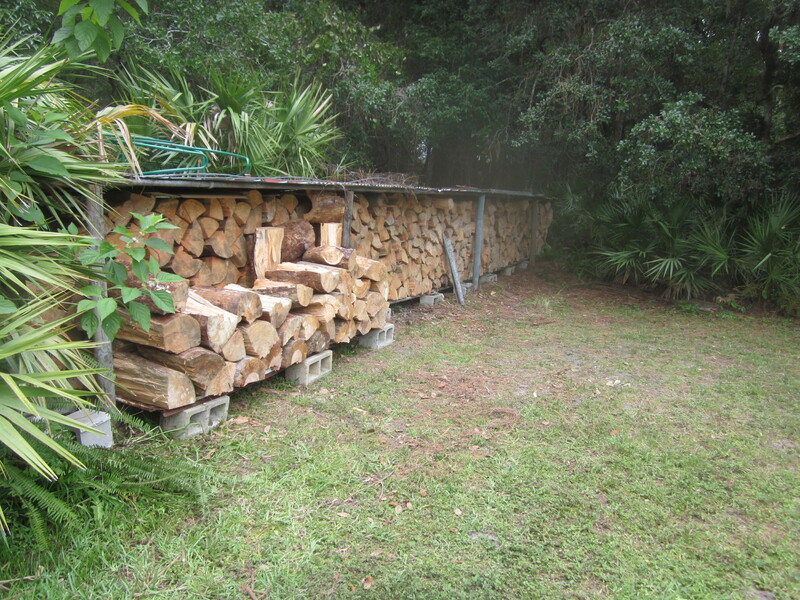 To calibrate you on the size of the woodpile in the pic, it’s 50’ long, stacked 5’ high. We’re going away for the weekend to South Carolina. Lindsay’s new baby is getting christened and we wouldn’t miss it. It’s about a 7 hour drive which we routinely drive in one day but decided to drive about halfway coming home so we can stop at Costco in Jacksonville for our quarterly “big buy”. The closest Costco to us is an hour away and we would be hitting it in the next few weeks anyway so it makes sense to incorporate it into this trip (my brides logic).